The Zanja Madre (Mother Ditch) is the original aqueduct that brought water to the Pueblo de Los Angeles from the Rio Porciuncula (Los Angeles River). It was originally an open, earthen ditch which was completed by community laborers within a month of founding the pueblo in 1871. The ditch underwent many alterations over the years and was still in use until the early 20th century. 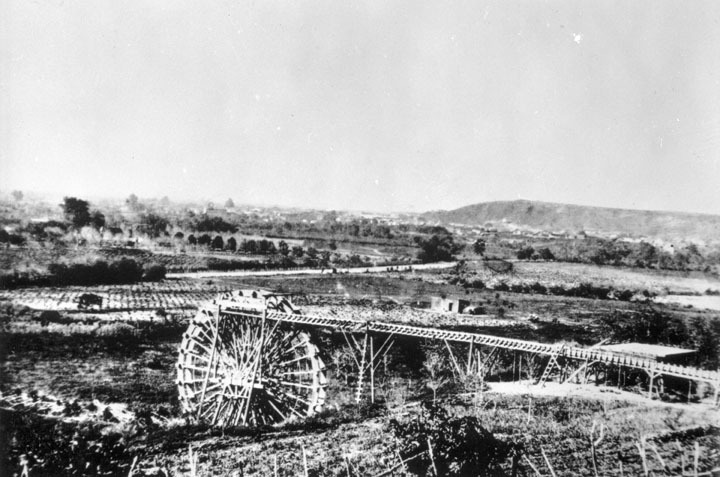 (1863)* - A water wheel on the Los Angeles River at start of Zanja Madre. The river has been the life-source of Los Angeles since it was settled in 1781. The water wheel seen above was 40 feet in diameter. It was used to raise a portion of the Los Angeles River water supply to a height permitting gravity flow to homes, fields and storage. In 1857, William Dryden was granted a franchise by the City Council to construct a system to provide a water supply. Under this system a brick reservoir was built in the center of the plaza to store the water brought to it by the Zanja Madre. A water wheel was also constructed to lift the water from the river to the Zanja Madre. Water then was distributed to a number of houses along the principal streets through a system of wooden pipes. Click HERE to read more about William Dryden. (ca. 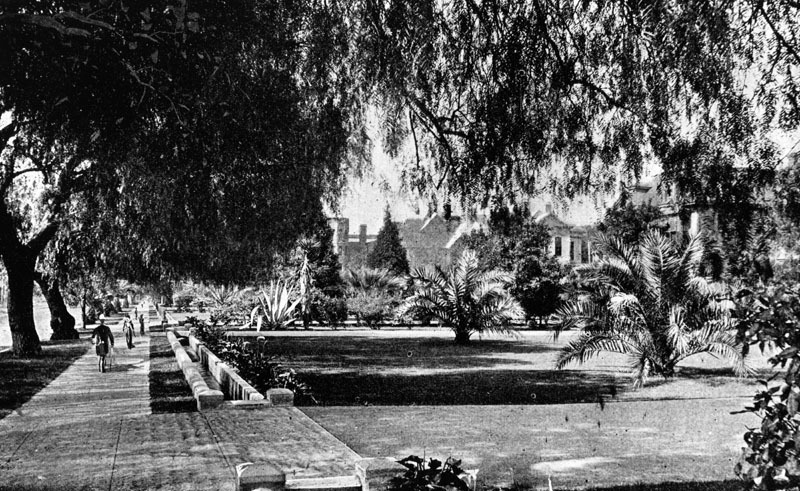 1858)* - This is the earliest known photograph of the Los Angeles Plaza. There is a square main brick reservoir in the middle of the Plaza, which was the terminus of the town's historic lifeline: the Zanja Madre ('Mother Ditch'). The reservoir was built in 1858 by the LA Water Works Company. In 1857 William Dryden and his newly incorporated water company, Los Angeles Water Works Co., erected a forty foot water wheel to lift water from the LA River to the city's main water ditch, the Zanja Madre. He then constructed a large brick and wood storage tank (in 1858) in the center of the city plaza as seen above. It would remain there for about 10 years and then be replaced by a fountain. 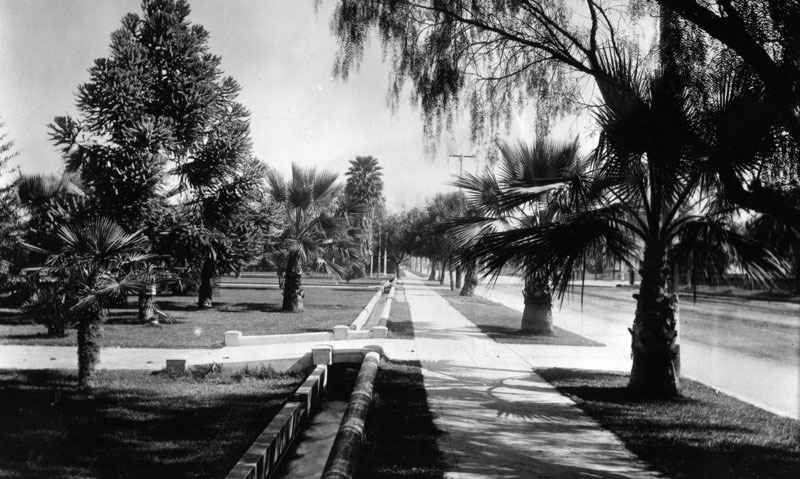 Afterward, water would continue to be stored in other tanks on the periphery of the plaza as well as in other nearby reservoirs (Click HERE to see more in Early LA Water Reservoirs). (ca. 1860)* - Sketch of the first stone reservoir in Los Angeles. Fed by the Zanja Madre, it would remain in the center of the LA Plaza for about 10 years and then replaced by a fountain. (1868)*^ - This manuscript map traces the path of the essential lifeline of early Los Angeles: the Zanja Madre, or Mother Ditch, prepared by cartographer William Moore. (1868)*^ - Map showing the route of the Zanja Madre irrigation system prepared by William Moore. (1873)*# - Ruxton Survey of the Central Pueblo. 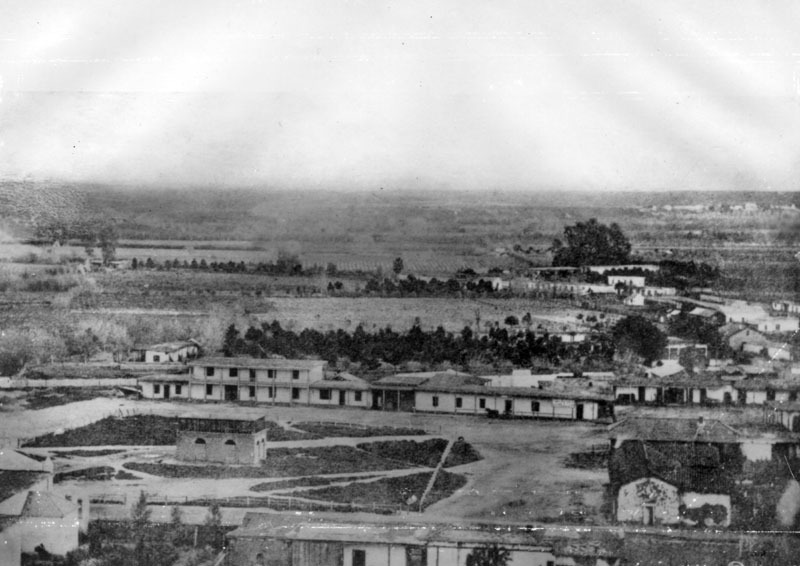 This oversize plat shows the plaza area in 1873, including the center of town with the early buildings and the zanza madra (zanja madre) which was LA's original water aqueduct and lifeline. 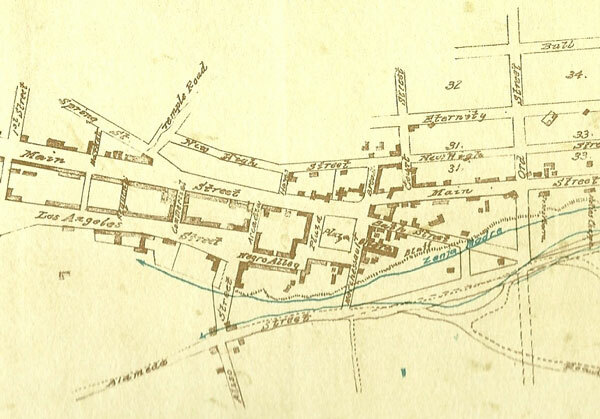 The map also shows the streets in use and the early owners of many of the properties. The layout of the plaza itself, however, is shown as it appeared before the change in landscaping in the prior two years before it became rounded. (ca. 1900)* - Washing clothes at the Zanja Madre. 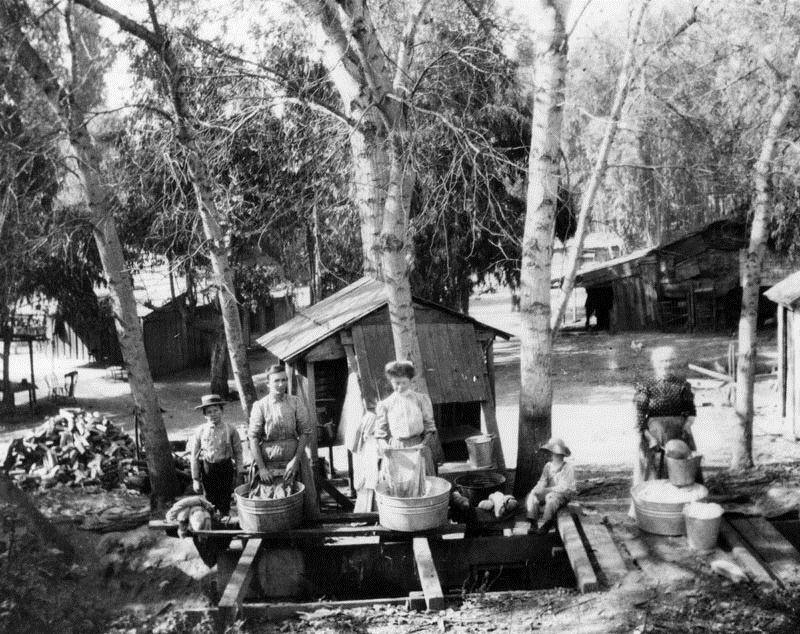 View of three women and two children washing clothes at the Zanja Madre. A few small buildings, visible throughout the image, appear to serve as barns. 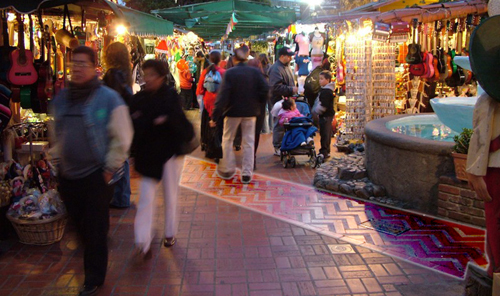 The Zanja Madre system ran from the Los Angeles River for more than a mile to the plaza, where the Olvera Street marketplace is now. Residents not only got their drinking water from the ditch, but the surrounding vineyards and farmland were also irrigated by its water. 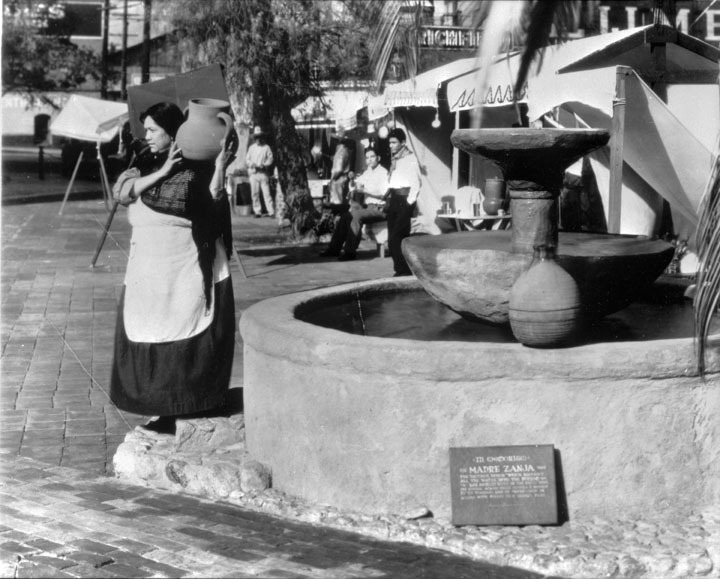 (Date unknown)^ - Woman carrying a water jar from the fountain at Olvera Street. (ca. 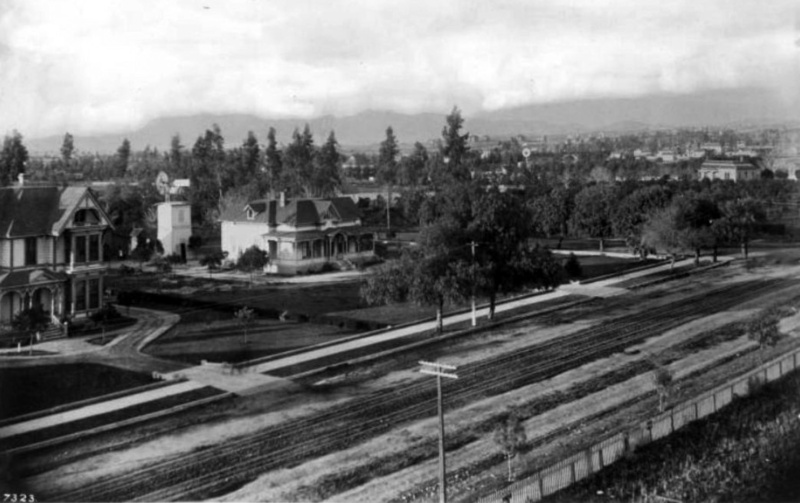 1890)*^*– View looking northwest showing an unpaved Figueroa Street. Note the water-filled ditch (Zanja) on the west side of Figueroa with walkway crossings in front of each of the large homes. A two-story Victorian-style house is visible to the left, followed further to the right by a one-story clapboard-sided home with a porch, to the left of which a windmill is situated. (ca. 1895)* - View of Figueroa Street near 23rd Street, showing the Zanja water supply channel and people walking on the sidewalk. The houses have massive lawns. (ca. 1900)* - Zanja on Figueroa Street near Washington Boulevard was the original water supply channel for the southwest part of the city. 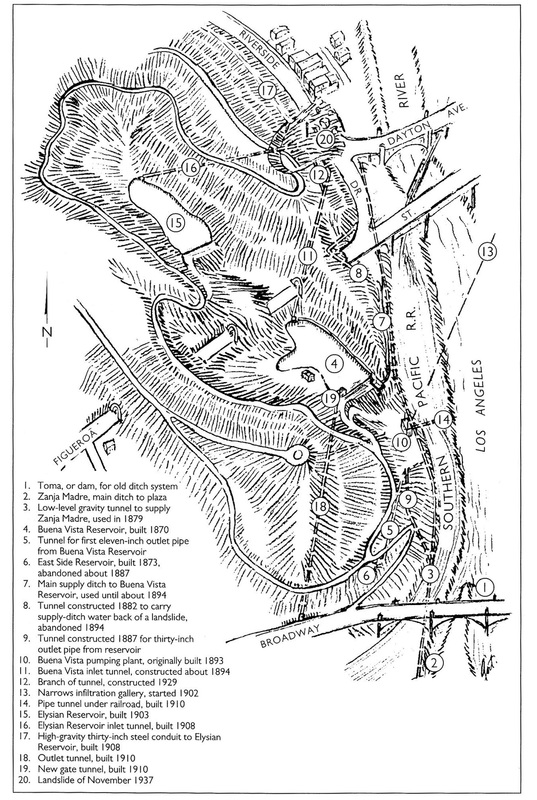 (1938)^* - Map of the Elysian Park area showing waterworks structures dating from Zanja Madre days to 1937. 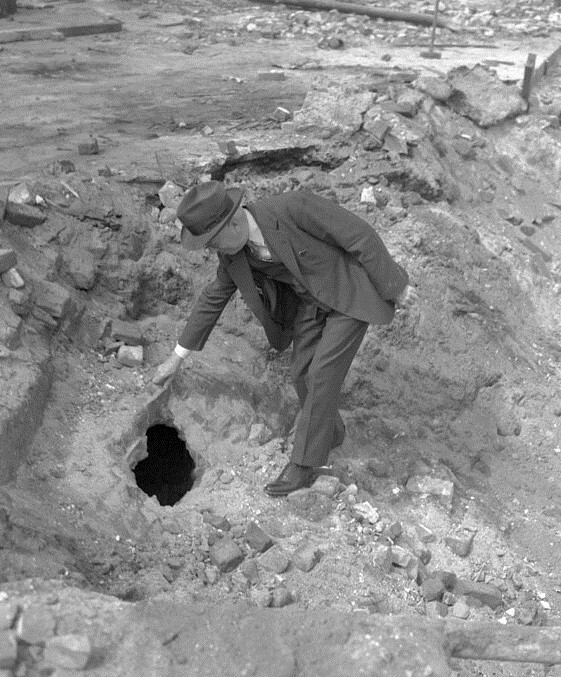 (1939)* - William W. Hurlbut points to hole punched in Zanja Madre. 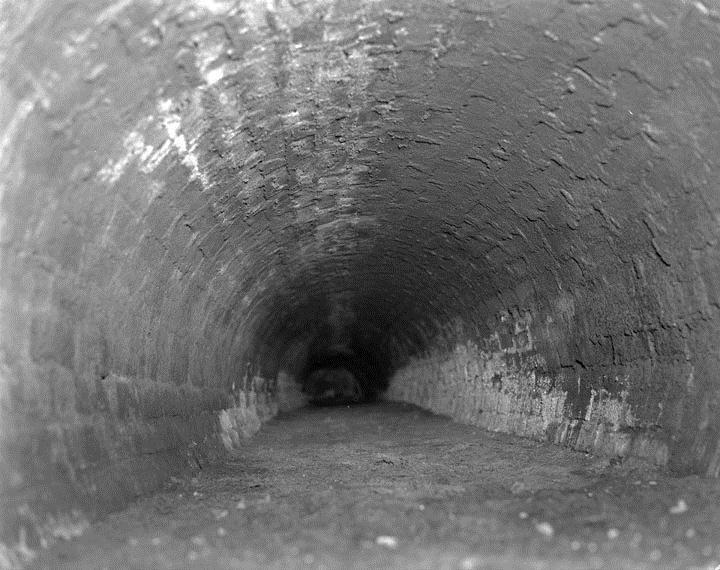 (1939)* - Interior of Zanja Madre uncovered during wrecking of first Department of Water and Power building - The old “Zanja Madre” or mother ditch, carrier of much of Los Angeles’ water supply during the middle of the last century, has again became the subject of historical discourse. This time because workmen, while excavating on Olvera Street, came across traces of a small redwood bridge which used to cross it. As the population grew it became necessary to protect the Zanja Madre from the pollution of the local environment – animals, trash, even an occasional drunk falling in. Consequently, the City Council provided for the zanja to be bricked over so the water would flow through unpolluted. Today, you can see a remnant of the bricked-over Zanja Madre in the area behind the Gold Line station in Chinatown, preserved by the Metro rail system. Also, in the heart of Olvera Street, in the DWP two floor display, at the lower level there is a part of the Zanja Madre preserved there, too. (ca. 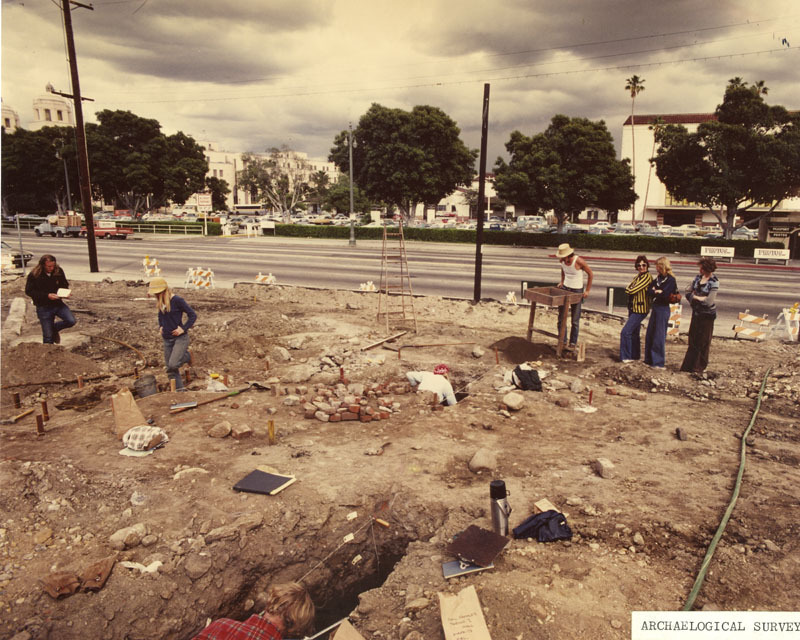 2000)* - Scientists working on an archaeological survey across Alameda Street west of Union Station at the time of the discovery nearby of a part of the Zanja Madre (early water canal). 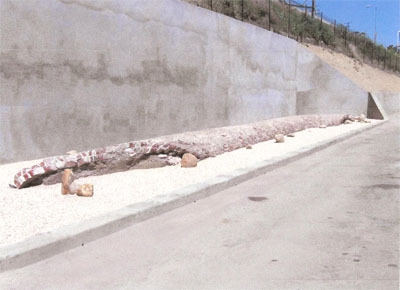 The first Zanja Madre segment found on adjoining private property in 2000 is only about 5 feet long. 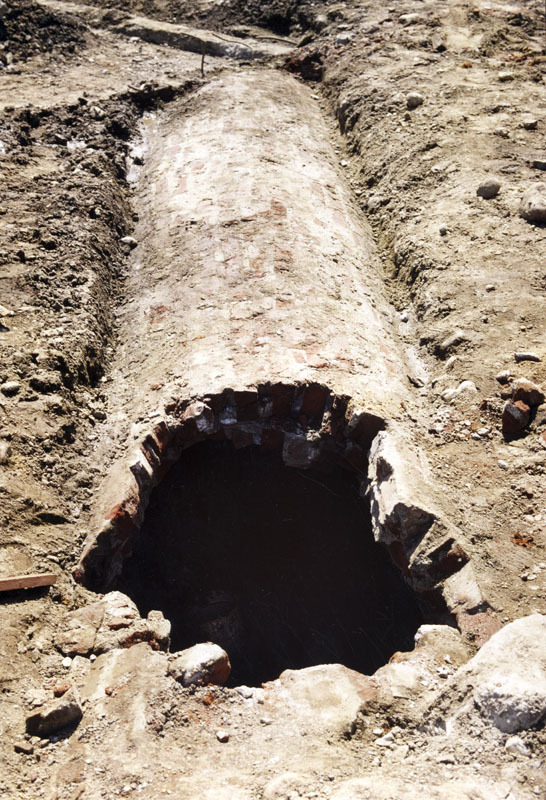 However, the segments discovered by archaeologists in 2004 appear to represent another intact segment of brick conduit of about the same length as the one preserved by Metro on their property. 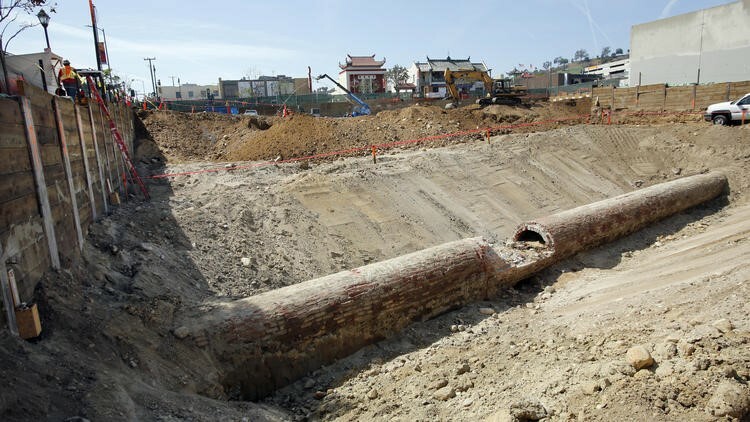 (2014)^* - View of another section of L.A.'s original Zanja Madre unearthed at a construction site located on the northeast corner of Broadway and College Street in Chinatown. In April 2014, construction crews unearthed a section of the Zanja Madre while excavating for a new five-story mixed used housing project located on the northeast corner of North Broadway and College Street, 900 N. Broadway. 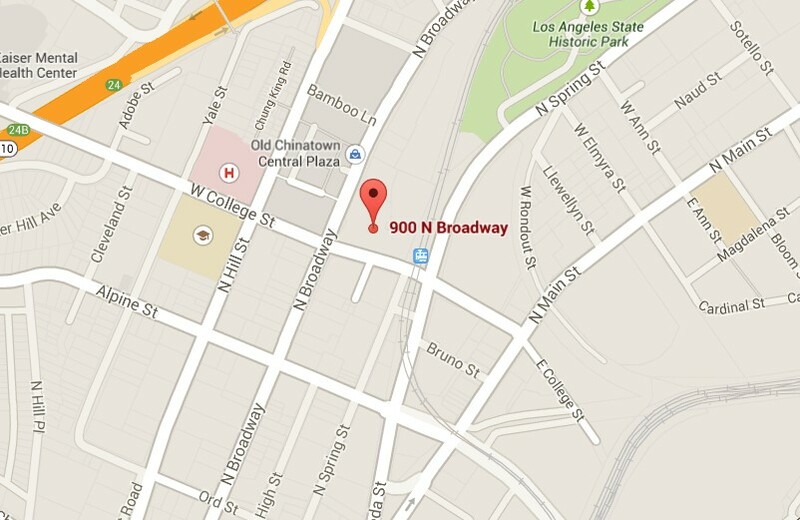 (2014) – Google Map view showing location of an original Zanja Madre segment at 900 N. Broadway. 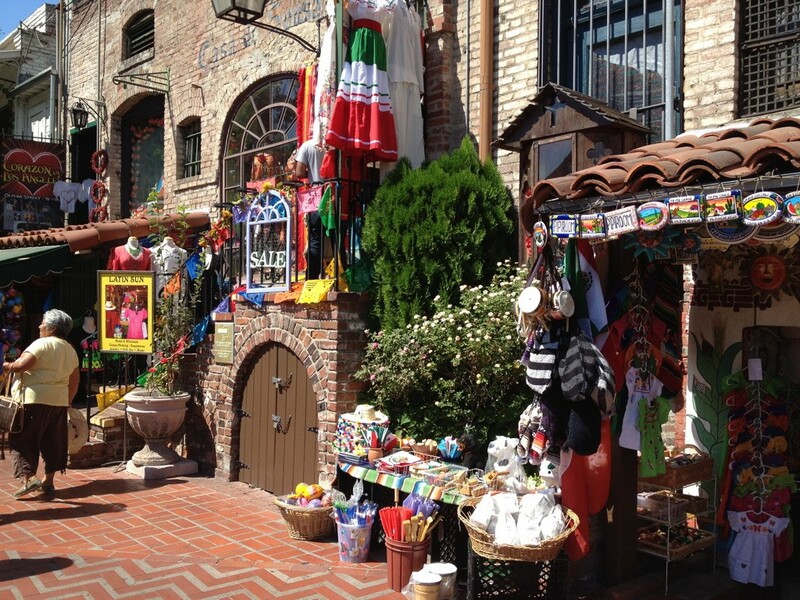 (2014)#* - View showing the path of the Zanja Madre (foreground) as it crosses Olvera Street and then runs under the Hammel Building (right). A new LADWP Historical Exhibit is scheduled to open in late 2019. Located in the Hammel Building (seen above), it will include a viewing platform from which the public can see an exposed portion of the original Zanja Madre. Click HERE for more on the new LADWP Historical Exhibit. 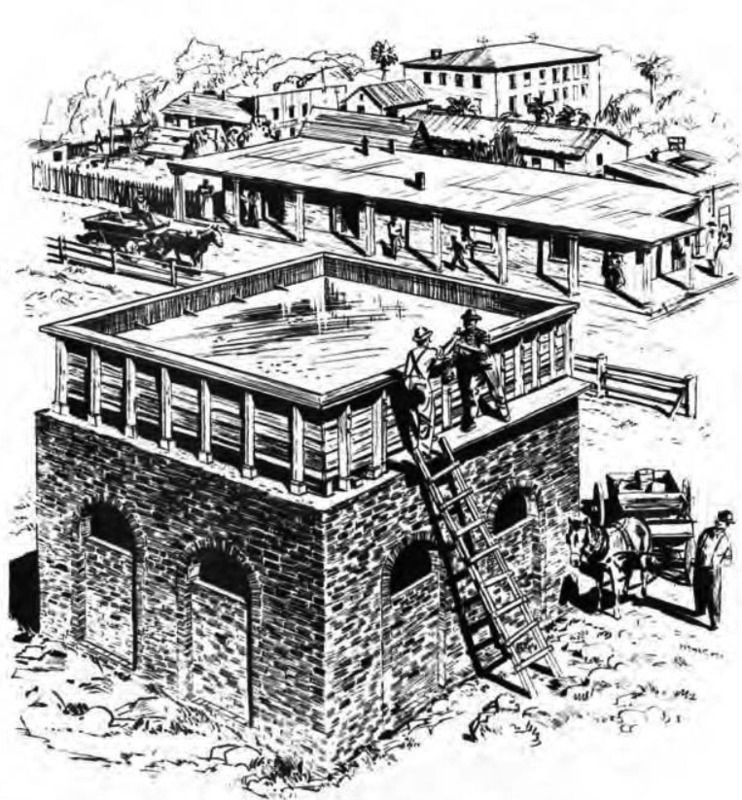 Click HERE to read more about LA's Early Water Works System from the LADWP Historic Archive. ^* William Mulholland and the Rise of Los Angeles by Catherine Mulholland from Thomas Books, assisted by Laurance E. Goit, Notes on Los Angeles Water Supply, September 1938.